Description: It is located in the Jotunheimen mountain range inside the Utladalen Landscape Protection Area in the municipality of Årdal. 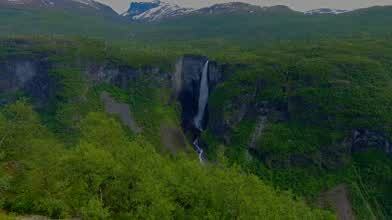 The waterfall has a single drop of 275 meters (902 ft).Wher The hike to the waterfall goes through Utladalen valley. Where you have a narrow river called Utla in the bottom, and steep mountains who raises from 50 meters to 2450 meters, on both sides. The hike takes 1 hour to the bottom , and 2 hours to the top of the waterfall. And on the hike to Vettisfossen you can enjoy 3 others spectacular waterfalls.